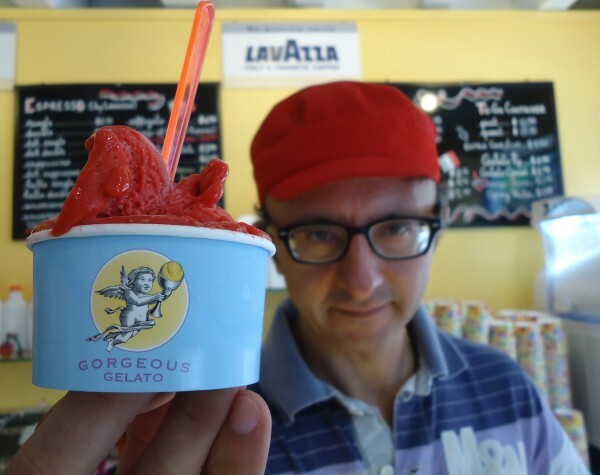 Donato Giovine of Gorgeous Gelato, showcases his gelato mentioned in Travel and Leisure this month. Portland was ranked the sixth best city for ice cream in America. There’s another gelato shop across the street and several scoop shops steps away. So the owner of Gorgeous Gelato was not surprised that Travel + Leisure magazine ranked Portland the sixth best ice cream city in America this week, signaling his shop in the top three. “We have a very, very small budget for advertising, so for us this was like gold,” said Giovine. Giovine suspects the magazine didn’t set foot in his purple and yellow shop (If they had they would have mentioned “the texture and creaminess of our gelato,”) still, he expects it will give him a bump in business. Customers digging into the creamy dessert, that technically is not ice cream because it’s made with more milk than cream, were in agreement with the city’s latest food accolade. Giovine’s wife Maria Grazia, who studied at the University of Gelato in Perugia, Italy, makes 16 flavors, such as panna cotta with caramel and mokaccino, every day. The national recognition will help the gelato industry, she said. “It’s good news. Maybe people will know what gelato is in the future,” she said. Those in the know, like food tourist Jimmy Zalcman, say Portland’s dessert scene has arrived.